Children need to be protected from dangerous things. That’s just a simple fact of life in modern society, as children may not possess the requisite knowledge or wisdom necessary to avoid dangerous situations. This is a particularly important point for all dog owners to remember, as children are particularly vulnerable to dog bite attacks and they can suffer massive, permanent and disfiguring injuries relatively quickly if a dog bite attack is neither prevented nor stopped immediately. This may be a harsh reality for dog owners, but reality it is, and every dog owner needs to do whatever is possible to prevent dog bite attacks on children from occurring. Failure to do so in California could lead to a lawsuit and significant financial and legal liability. Let our Irvine children and dog bites attorneys protect your family when a dog bite occurs. “My Dog is Great with Kids” – If We Had a Quarter for Every Time We Heard That… It Only Takes Once! 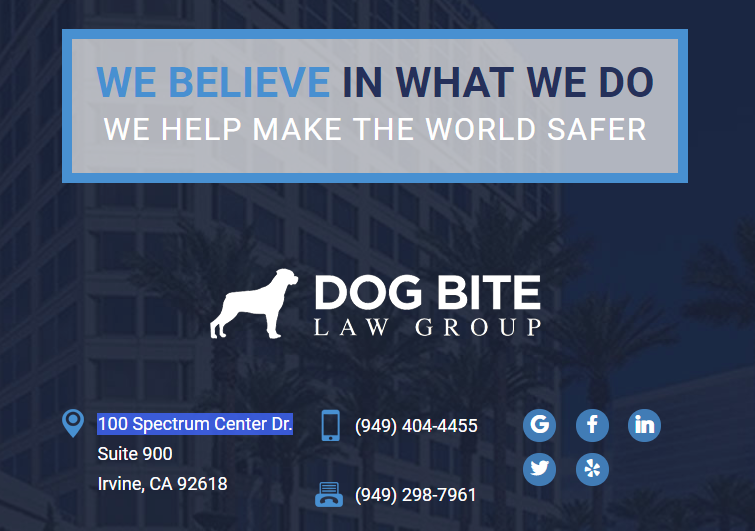 Our Irvine dog bite attorney at the Dog Bite Law Group has helped a lot of families fight for and recover damages from dog owners whose dogs bit, attacked and severely injured children in those families. These are always very difficult situations for everyone involved. As such, our firm would like to provide some perspective on what many believe is a public safety problem in hopes that dog owners out there will realize the seriousness of both this problem and their duty in owning a dog. Parents whose children have been injured in this manner should contact the firm as soon as possible to schedule a free initial consultation. For Kids’ Sake is an organization that has put together an initiative called the Safety Around Dogs Program. As part of its effort, the organization has compiled statistics regarding children and dog bites attacks in the United States. A few examples of these troubling statistics appear below. Those who would like to review the entire breakdown can find it here. The CDC estimates that half of all children under the age of 12 have been bitten by a dog. The CDC also estimates that the odds of a child being bitten by a dog are 3.2 to 1. 79 percent of fatal dog attacks involved children. 77 percent of all dog bite injuries to children under 10 involve the face. Children between 5 and 9 years of age face the highest incidence of dog bite attacks. These are clearly troubling statistics, and they should be taken to heart by every person who owns a dog, whether that dog owner has children or not. Dog owners need to take steps to minimize the chance of a dog bite attack. Choose the type of dog you get carefully. Your veterinarian is an example of someone who can help you make the right decision on the breed, age, etc. Socialize your dog as soon as you get it. The sooner your dog gets used to being around people and other dogs, the less stress it will encounter around them in the future. Supervise your dog around children at all times, regardless of whether your dog is familiar with that child or children or not. Immediately step in and correct any potentially problematic behavior by the dog. Immediately end any interaction where the dog shows any signs of aggression. Do not feed your dog or allow it to drink water in the immediate presence of children. Give your dog a “private” space to retreat to if it needs time to calm down. Train your dog thoroughly. Teach it to obey commands instantly. Always keep your dog on a leash in public. Neuter your dog, as doing so tends to make it less aggressive in nature. Make sure your property is secure so that your dog cannot reach passers-by through a hole in the fence, etc. Spend time with your dog and make sure that it gets enough exercise on a daily basis. Maintain a schedule of regular checkups with your dog’s veterinarian. Immediately deal with any signs of illness or injury with your dog. Any of these steps could make the difference between avoiding a problem altogether or suddenly dealing with a tragic situation. While almost everyone loves dogs, and that includes the California dog bite lawyers at our firm, we must all remember that they are animals and that they need our constant guidance, training, direction, and reinforcement so that everyone can coexist peacefully and happily. If every dog owner took the steps described above, the troubling statistics regarding dog attacks on children would certainly improve. Unfortunately, that’s not what occurs and dog owners in California whose dogs injure children or anyone else can face significant legal and financial challenges as a result. California is known as a “strict liability” jurisdiction when it comes to dog bite attacks, meaning that the dog owner can be liable for damages even if that dog owner was not negligent in causing the attack at issue. We all need to do our part to encourage responsible dog ownership. That includes filing lawsuits when dogs cause serious injuries to children. If this has happened to your child, you need to stand up and fight for your child’s rights, as you can and likely will face enormous losses going forward. If you need this type of help, you can contact the Irvine children and dog bites attorneys at the Dog Bite Law Group to have your situation evaluated free of charge. Do so today so that you can move forward with a foundation of knowledge.